Update (13.03.2010): It's still in developement. The scrolling routine has been almost totally rewritten, in order to save CPU power. Mappy shall be replaced with a custom editor. More information and new screenshots are available at the Devblog. TheFinalFighter works on a Turrican clone for the DS since march 2009. 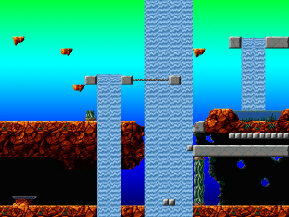 For now, it will uses graphics from the Turrican2 MS-Dos version. The project is in the beginning phase, but shows some fast progress. The level will be created in the open "Mappy", which makes hope for a possibility for users to create own worlds. The progress is documented in a devblog.